My skincare addiction has been pretty well documented, at this point. Green beauty truly has some of the best skincare to offer, with pure ingredients that have done wonders to my skin. But I'll fully admit that my skincare obsession has kind of put my makeup collection on the back burner, something I've been looking to change. There are so many wonderful green beauty cosmetics out there that it's a shame I've really limited myself to so few, and in the past few months I've really been trying to change that. 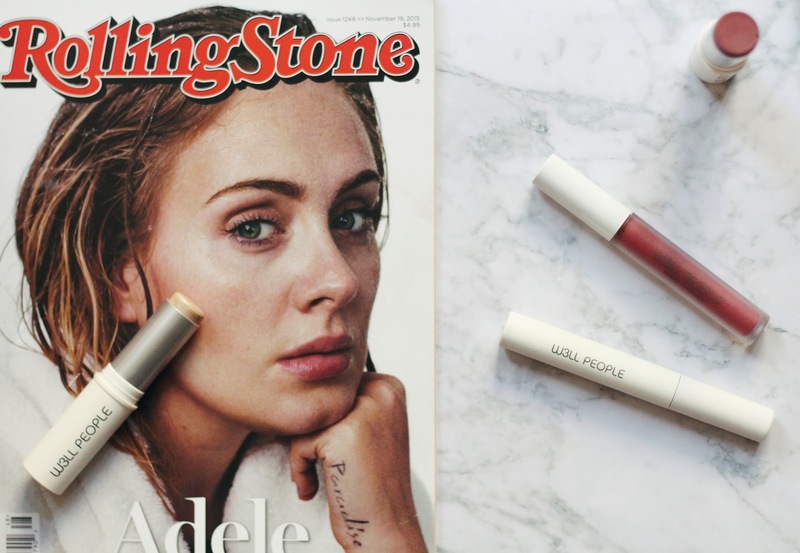 If you're a green beauty enthusiast like me you've probably heard of W3ll People, a brand that's earned some very well-deserved praise throughout the beauty blogging community. With well chosen ingrenients and high performing products, this was a brand I was really excited to try more from. I've been trying out their Fall/Winter Natural Beauty Essentials* for about a month now, a collection of some of their bestsellers that are perfect for this time of year, and I've really gained a great deal of love for the line. Let's start with the Expressionist Mascara*, an organic formula that promises truly voluminous lashes. Up until this point I've been pretty loyal to my Kjaer Weis Mascara, the only green mascara that hasn't smudged on me, but this one has truly given it a run for its money as my favorite. It leaves my lashes so thick and voluminous and I love the results. It's pretty hard to smudge, as well, though I'd probably say it's a little more smudge able then Kjaer Weis'. All in all, though, it's a wonderful option for any sensitive eyes. For the lips I've got two options, their Universalist Multi-Stick* (in shade 3 Berry Aubergine) and their Bio-Extreme Lip Gloss* (in Berry). The lip gloss is the perfect shade for fall, a berry that provides a bit of wearable drama. The formula itself is super hydrating and just the right amount of pigmented and has become a daily must wear for me recently. The Multi-Stick is equally as great, with a creamy, pigmented formula that adds just the right amount of wearable color to your lips or cheeks. I personally prefer to wear this to bring a pop of color to my cheeks, applying the formula either with my fingers or using my RMS Beauty Blush Brush. Finally there's the real star of the show, the unbelievably stunning Bio-Brightener Stick* (in Moonstone). I didn't think I'd ever find a highlighter that could hold a candle to my beloved RMS Beauty Living Luminizer, but this gem comes pretty damn close. The natural formula comes in a purse-friendly sized stick that can simply be twisted up to swipe just the right amount of creamy luminosity on your face. The bendable formula adds just the perfect amount of glow, which can easily be applied using the heat of your fingers. As much as I love the Living Luminizer, I must say that this formula is equally as natural looking and much more application-friendly. Instead of poking your fingers into a little tub of products you simply twist up this creamy stick and apply it right onto your cheeks, simply blending it a bit to soften it up. It's so simple that I can't believe I haven't tried it sooner. I can certainly see why this is so many people's favorite, because it's fast becoming my own. For those interested in trying a bit of W3ll People for themselves, the brand has kindly offered to give away one Fall/Winter Natural Beauty Essentials to one of my readers! Simply enter using any of the options below, and a winner* will be chosen on Sunday December 6th at 11:59PM. Good luck!